The term wireless refers to telecommunication technology, in which radio waves, infrared waves and microwaves, instead of cables or wires, are used to carry a signal to connect communication devices. These devices include pagers, cell phones, portable PCs, computer networks, location devices, satellite systems and handheld digital assistants. Wirelesss technology is rapidly evolving, and is playing an ever-increasing role in the lives of people throughout the world. There are a wide-range of wireless devices that implement radio frequency (RF) to carry the communication signal. Some wireless systems operate at infrared frequencies, whose electromagnetic wavelengths are shorter than those of RF fields. 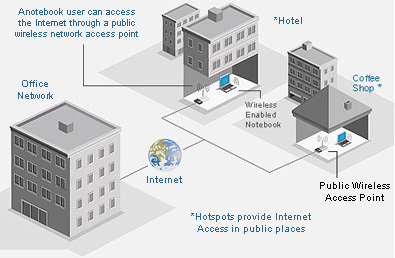 Your Wireless options can be divided into Fixed Wireless and Wireless HotSpots. Dependable, expeditious Internet access is the gateway to information... T1 is expensive if under used. Caught between fringe coverage areas for DSL service out of TELCO central offices in Napa and Vallejo many local businesses are forced into T1 service at expensive prices and bandwidth beyond their needs. Depending on location, but certainly in the South County Business Parks and American Canyon, T1 or Dial up have been the choices for internet access. At the request of a group of Napa Valley Economic Development Corporation business internet users, NVEDC initiated a meeting last November to encourage and discover alternatives and solutions. We are proud to announce that NapaNet has stepped up to the plate and can now offer high-speed Wireless internet access options approaching and surpassing DSL speeds at value pricing arrangements. As Napanet's number one service, we have been transformed into a dynamic WISP (Wireless Internet Service Provider) offering unique internet solutions. With equipment located in Napa, this service has changed the way people live and work in the Napa Valley!